The question, posed by fast diminishing group of people, of whether Winx had to race overseas to prove a point has been resolved in resounding fashion courtesy of the result of the 2018 Secretariat Vox Populi Award. 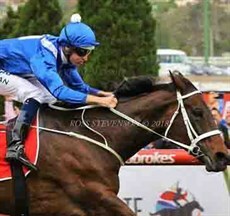 Winx is the 2018 winner this prestigious annual award. “Vox Populi” is a Latin expression which literally means “voice of the people” The award gives recognition to the horse whose presence in the racing scene has resounded most with the general public, in the process lifting the profile and gaining positive recognition for the thoroughbred industry. As such, distinct from other achievement awards, this is a global popularity contest of the highest order, bridging continents in a sweeping, uncomplicated manner to decide the most deserving winner with an on-line poll encompassing data submitted from over sixty countries being key to the outcome. The fact that Winx beat Triple Crown winner Justify and dual Arc and Breeder’s Cup winner Enable to the line underlines the magnitude of her achievement. Up until now the award has been the domain of American horses, not surprising when it is believed that up to eighty percent of the votes come from the United States. It has been reported that only six percent of the votes for the 2018 award came from Australia, where Winx completed a perfect year winning all seven of her seven starts including, of course, that amazing fourth Cox Plate victory. Winx now joins the likes of Zenyatta (who, like Winx, was sired by Street Cry), California Crome and American Pharoah as Secretariat Vox Populi Award winners. Winx’s co-owner spoke to Debbie Kepitis spoke to the TVG broadcaster at Santa Anita shortly after being part of the award prestation ceremony at Santa Anita earlier this month. “It’s been wonderful. It’s been surreal,” Kepitis said. “We’ve been signing posters … a beautiful painting was made into a poster … and everybody is just enthralled with her. It’s lovely that they’ve voted for here and she has won this award. “There is lots of nerves leading into it (her runs). I don’t know why. My being nervous makes no difference to how she runs but it is the excitement and the joy of watching her. She is like our child now. It’s like I’ve got a fourth daughter … and the other owners all feel the same. 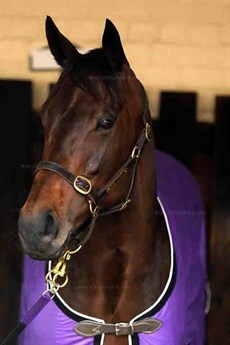 “The staff at the racing stables have taken her to their heart. I just get caught up in it and the relief, as well as the excitement of what she does … well, I just carry on like a lunatic. “We are so proud of her and so pleased that everyone enjoys her the way we do. It’s hard to put into words all of the thoughts we get from everyone … the emails that the stable gets … the stories. Winx trialled at Rosehill on Tuesday and trainer and jockey were all smiles when she came back off the track. Chris Waller and Hugh Bowman spoke to Sky Racing shortly after the trail. Trainer Chris Waller: “Hughie and I are focussing on getting her ready for her first run … first and foremost … and everything looked pretty good to me this morning. This preparation has not been any different except that we allowed an extra week, if we needed it, to get her a little bit fitter. “Apart from that it is just business as usual. When you are talking about her age, we are only really three months beyond from when she won her fourth Cox Plate so it is not as if she is a year older or anything like that. If anything, she looks better than we have had her at the same stage and her body language is just fantastic. "Early on in her career … she was not on edge but she was charged up, hence the reason why we had ear muffs on her right from the start … making sure she saves it all for race-day. I don’t think there is too much change really. If anything, it is a positive that she is showing she is enjoying herself and not getting any signs of stress about her. “It is just like last preparation … one step at a time. The Apollo Stakes first-up at Randwick in the middle of February and then just take it from there. Provided Hugh is happy and the owners are happy and, obviously if the signs are there that she can progress through to a second, third or maybe a fourth start, we’ll just take it as it comes. Hugh Bowman: “I was really pleased. Obviously, we saw she missed the start … she’s has a habit of doing previously. She’s been pretty good the last couple of preps. Because she did that, I didn’t want to rush her into her gear and, you know, it took a little while to tack onto the field but her best work was certainly when she went past the winning post and beyond. “Her action was great. Her mannerisms … if anything were probably more relaxed than usual which she has shown signs of in her gallops leading into the first trial. As long as her action is fine … and the way she finished off, I was very pleased. “Supreme athletes, if they love to do it, can continue at a high level for a long time … especially the way she looks after herself and, the way Chris pointed out, she really does save it all for game day. That was even evident in the trial at the 200m where she wasn’t even going to tack on unless I made her just finish her trial off. “If that was a race, I would have been holding onto her as I was going past the leading bunch. It’s just the way it is. She is just a mature athlete now. She seems to be enjoying it. Her action and her strength is as good as ever. 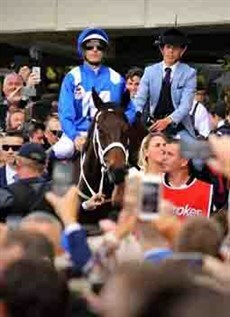 Winx is the 2018 winner the prestigious Secretariat Vox Populi Award.